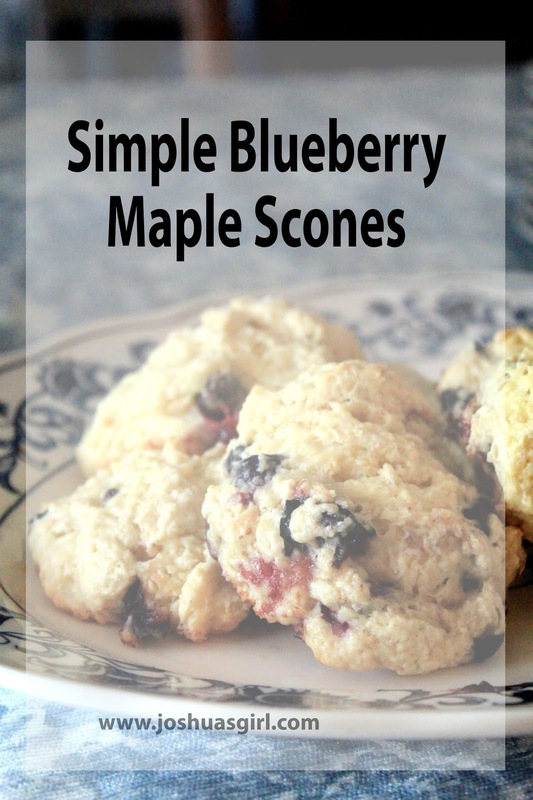 I love easy recipes that uses simple, yet fresh ingredients, and these scones were the perfect example of that. We had a little tea party with a few friends last week, which prompted me to make a batch of scones served with real whipped cream. 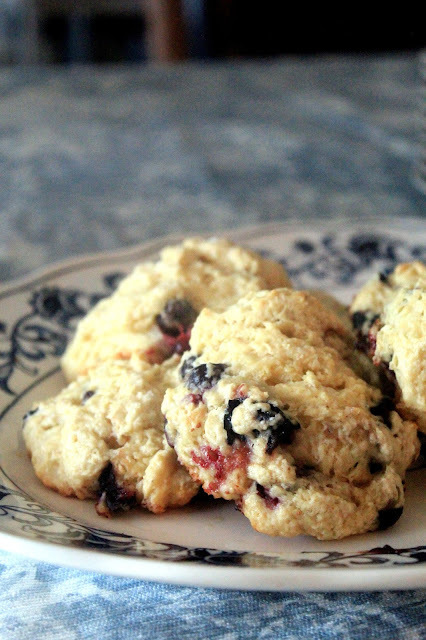 I've tried many scone recipes over the years, and I always prefer the more rustic variations. Slightly brown on the edges, soft and bursting with berries! I confess, this recipe uses both maple syrup and sugar...yet it doesn't taste overly sweet. The trick here is to make sure you cover them foil while baking so they don't get too brown. Maple syrup tends to do that in baked goods. Care for the recipe? Pour a cup of tea, a pot of cream, and enjoy! In a large bowl combine dry ingredients and butter. Cut the butter up and mix with dry ingredients until mixture becomes crumbly. In a separate bowl, mix eggs, vanilla, maple syrup and sour cream. Pour into dry ingredients and mix well. Add 1 - 2 Tablespoons of Milk or until mixture becomes moist and sticky. Very gently add blueberries. Using a large ice scream scooper (or 1/4 cup scoop) gently plop onto baking pan. Brush with a bit of milk and sprinkle course sugar on top. Bake at 325 for 20 to 25 minutes or until lightly browned. Be sure to pin the recipe! Can you believe I've never had scones? I just have to find a way to make these delicious treats! We enjoy a good scone recipe. Blueberries is a favorite. Haven't made scones for awhile so this will be good. These look so delicious. I use to love baking. I am going to have to try making these for Sunday morning.